Skin Care – Why Photofacial? 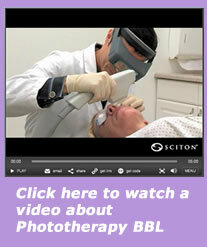 Phototherapy BBL (BroadBand Light) Brings a New Approach to Beautiful Skin! BBL is an innovative technology that sets new standards for skin conditions associated with aging, active life-styles, and sun damage. A photofacial using BBL energy is commonly used for rosacea treatment, age spot removal, the minimizing of small facial veins and sun spots, and many other skin conditions. Your photofacial treatment will be tailored to match your skin type and your desired results. This leading edge technology enables treatment of multiple skin conditions with various wavelengths seamlessly using change-on-the-fly Smart Filters. During your initial FREE skin analysis consultation at the HCA Skin Care Center in Grand Rapids Michigan, our staff will outline the optimal treatment plan for your goals. Read about what to expect at the consultation, or keep reading to learn more about what conditions BBL treats and find the answers to frequently asked questions. BBL Photofacial treatment is an effective procedure for age spot removal, as well as reducing the appearance of freckles. This process is not limited to the face and can be done on the hands, arms, neck, etc. Photofacials are also an excellent option for balancing uneven pigmentation, and are an effective Rosacea treatment. The process works by stimulating your skin cells to produce more collagen. In turn, the colors of your natural skin tone blend to create a more even, balanced appearance, The photothermal energy also eliminates fine vessels that cause skin redness, significantly reducing Rosacea and pigmented lesions. Pigmented Lesions, freckles, and sun spots. The light energy delivered by the BBL will gently heat the upper layers of your skin. The heat absorbed by the targeted areas will stimulate your skin cells to regenerate new collagen. This process will restore your skin to its natural beauty, blending its natural colors and making it smoother, vibrant, and younger-looking. In addition, the photothermal energy will eliminate the fine vessels that cause redness and rosacea, and reduce unwanted melanin that produces pigmented lesions. What areas can be treated with a photofacial? Any area of your body can be treated. The most common areas are those most exposed to the damaging effects of sunlight. The most popular treatments are on the face, neck, back of the hands, chest, and shoulders. The number of treatments needed will vary from patient to patient. Your clinician will personalize a treatment plan based on the level of improvement you desire. We may also combine your treatment with other popular aesthetic procedures to further personalize your treatment. Getting a free skin care consultation at the HCA Skin Care Center in West Michigan will help determining your skin’s specific needs. The photofacial procedure is gentle, noninvasive, and safe. Generally, there is no need for a topical anesthetic. However, your physician may choose to use it on more sensitive areas. You may experience some redness that should resolve within a few hours. For some pigmented lesions, you will see a darkening of the treated areas followed by a fading and flaking off at a later stage. Your treated skin will feel smoother, fine lines and pores will be less noticeable, and sunspots or uneven pigmentation will fade. Results for age spot removal, rosacea treatment, and other BBL procedures will depend on your condition, the number of treatments, and the area treated. Your physician will provide you with complete information about the post-treatment care and results. How long will it take to recover from a photofacial? It is important to follow your clinician’s instructions. You may be given some skin care products and instructions on how to use them. You will be sensitive to ultraviolet light and you must avoid direct sun exposure until completely healed. Fully cover your skin or use a good sunscreen when you go outdoors. The key to getting the results you want is to find a program tailored to meet your specific needs. The team at Holistic Care Approach in Grand Rapids, Michigan will listen and talk with you about your health goals and the obstacles in your way, then work with you to get you started on the road to feeling your best. We offer packages of services, or we can customize a program especially for you. Contact us or call 616-361-9221 to schedule your FREE skin analysis consultation.